At the dawn of rapid prototyping, a common predication was that 3D printing would transform manufacturing, spurring a consumer revolution that would put a printer in every home. That hasn't quite happened—-and like so many emerging technologies, rapid prototyping has found its foothold in a surprisingly different field: Medicine. 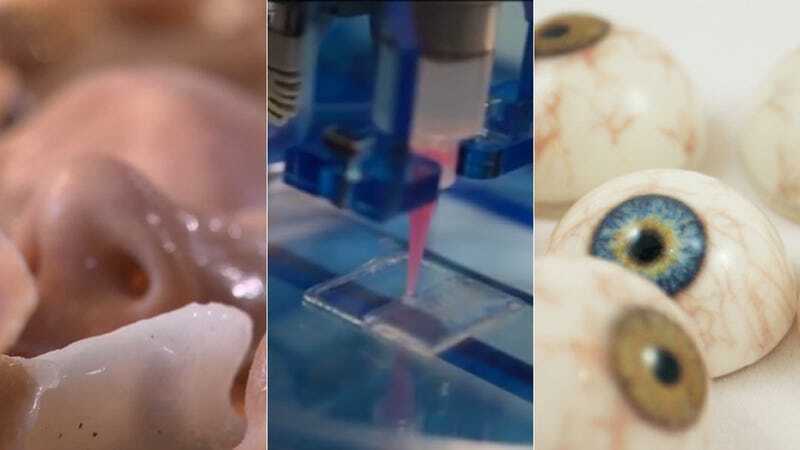 The following studies and projects represent some of the most fascinating examples of "bioprinting," or using a computer-controlled machine to assemble biological matter using organic inks and super-tough thermoplastics. They range from reconstructing major sections of skull to printing scaffolding upon which stem cells can grow into new bones. More below—and look out for more 3D printing week content over the next few days. A big problem with the idea of "printing" new skin is how difficult it is to recreate a particular skin tone in every kind of light: Because our skin is so unique, thin, and mutable, it's hard to perfect an exact replica. There are too many interesting studies to discuss in a short paragraph, but two highlights: Wake Forest scientist James Yoo is working on machine that can actually print skin directly onto burn victims as part of a DoD-funded grant, while scientists at University of Liverpool are using carefully-calibrated 3D scanners they're using to capture samples of each subject's existing skin, which allows them to print a more accurate patch. Creating prosthetic ears, noses, and chins are often a painful, expensive, and laborious experience for patient and doctor both. A UK industrial designer named Tom Fripp has spent the past few years collaborating with University of Sheffield scientists to 3D print a cheaper, easier-to-make facial prosthetic. Their process involves 3D scanning a patient's face (much less invasive than casting it), modeling a replacement part, and printing it using pigment, starch, and medical grade silicone. … the researchers created an ink for the anode with nanoparticles of one lithium metal oxide compound, and an ink for the cathode from nanoparticles of another. The printer deposited the inks onto the teeth of two gold combs, creating a tightly interlaced stack of anodes and cathodes. Then the researchers packaged the electrodes into a tiny container and filled it with an electrolyte solution to complete the battery.